What are the benefits of computer optimization software? Clean up computer’s registry. Windows Registry contains data about the computer and almost everything that happens with it. It stores information about hardware, settings, installed programs, computer user’s passwords and basically every detail about the PC and what the user does with it. Be aware of the fact that Windows Registry is full of important keys that store data, and if you delete the wrong ones, you can severely mess up your computer system. That is we recommend you to use an automatic tool to remove unnecessary registry keys. Delete programs or files that you do not need or that you haven’t used in a while. The thing is, junk files and unused programs eventually amass in the computer system and can take up a lot of disk space. You should not pile them up – remove them to improve your computer’s performance and free up some space. Bear in mind that it may take a long time to find and remove useless files manually, so this is where the computer optimization software comes in handy. It automatically scans the system and detects files and programs that you haven’t used in a while. Don’t worry – the software shows all detected items for you before deleting them, so you can choose which ones you want to keep. Fix system errors. Every computer user encounters various system errors while using a computer. Some of them can be easily repaired manually, but others require a lot of time and patience. Therefore, it is much easier just to employ a PC optimizer and let it fix OS errors for you. Remove malware. Some computer optimization programs can detect and remove computer threats. It is definitely a very useful feature because computer viruses usually significantly diminish computer’s performance. Some computer optimizers are even capable of restoring system files that computer viruses corrupt. Detect which hardware parts need to be replaced. Although PC optimizers are not capable of solving hardware issues, they can detect them and inform you about them. Control Startup programs. Computer optimizers control Startup programs and also other computer processes, and they can see which programs you use often and which ones you do not. Therefore, they can disable startup programs that you never or very rarely use. We must say that each computer optimizer functions differently, and each of them has different set of features. 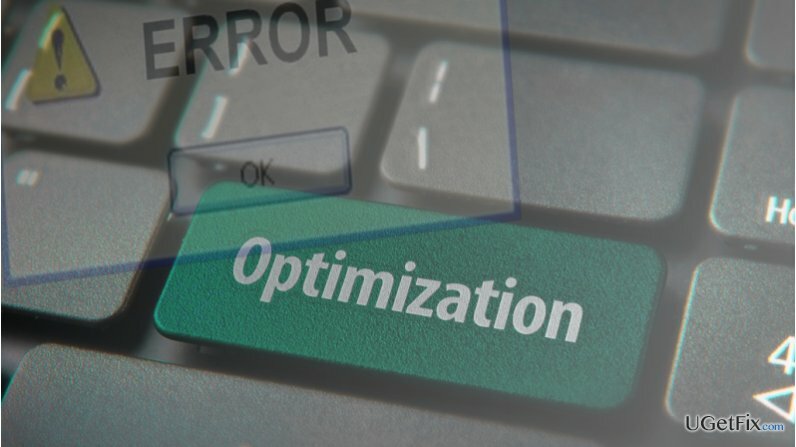 We want to warn you to be careful when choosing a computer optimizer, because the Internet is full of rogue PC optimization programs that are hardly useful. If you are looking for a good computer optimizer, we recommend using Reimage, PC Health Advisor or SpeedyPC Pro. Kodėl verta turėti kompiuterio optimizavimo programą? This entry was posted on 2016-05-27 at 06:24 and is filed under News.